May 21, 2012 by Venky. When a three inch screw made its way into my rear tire on my morning ride to get to the starting point of the race, I failed to see the signs. In retrospect it might have been a message from the MTB racing gods that you got to be tough as nails to survive and do well in today’s race or be ready to get screwed! This was the toughest race in BBCh so far in which I participated. I started riding from home at 5:30 am with plans of reaching to the starting point at around 6:30 am(26km). Although I was scared like hell at the prospect of suffering for 64km of XC trail after riding an hour prior to that, I tried to tell myself that it won’t be a bad warm-up for the sufferfest ahead. As I kept riding at a gentle pace and as I approached Sarjapur road, I began seeing other riders on bikes and in cars on their way to the race. After I went past the Total Mall on Sarjapur road, flying past a speed breaker, I began to feel a familiar shake of the tail and stopped to see what happened. Flat on the rear tire! It isn’t difficult to find the source of the flat when you see a nail head embedded between the knobbies. But it was a shocker when I pulled it out. It was HUGE!! The tube had two big holes. A couple of friends stopped to offer help and moral support. I assured them that I got it covered and I changed the tube before moving ahead. Near the starting point there was a buzz of activity. Everyone was busy unloading the bikes, checking tire pressures and getting it to that optimum figure between 30-40psi, registering and putting tags on their bikes. 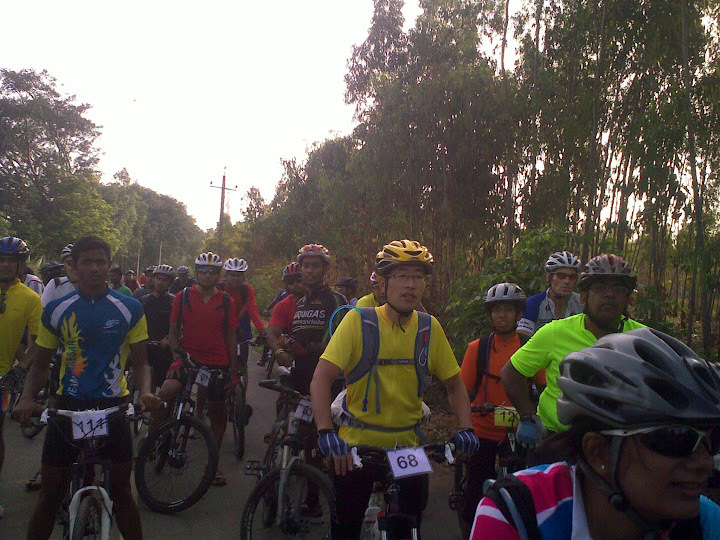 Even the most experienced of the folks were nervous at the prospect of a 64km XC race. As anybody who has ridden 20km of trails at a decent pace would tell you, it isn’t actually walk in the park. Imagine racing for 60+km. It would probably count as a 120km+ road race! I began to shudder thinking of the suffer-fest that it would unleash as soon as I saw the mail announcing the race. A couple of us frantically let some of the air out from the tires when experienced riders commented that it is a bit too high. Nervously, everyone lined up at the start line. As the trail head was a bit narrow, the start line was thoughtfully set about 100m before it on the road. The Start! A Billdy Frantic Rush! 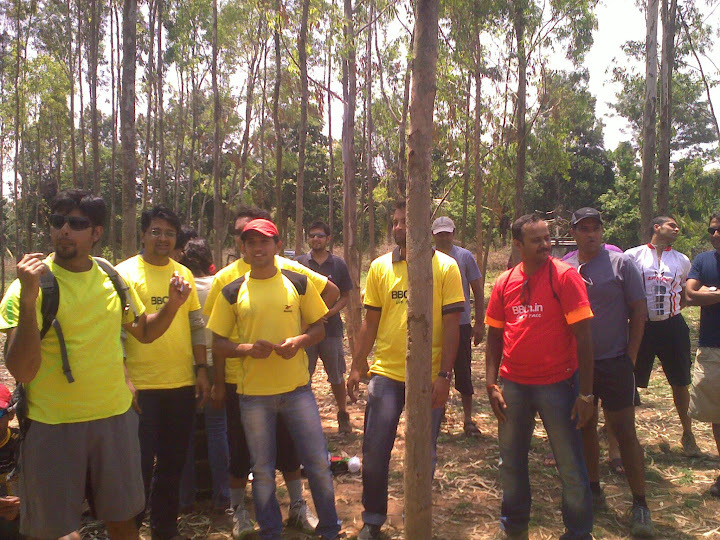 Vasu shouted out the countdown.. 3..2..1..Go… and we all sprinted up to speed and hit the trail head at full tilt. I was right behind the lead bunch of Darren, Richard, Scott, Bharath, Naveen and a couple of others. It was a crazy pace on the fast and flowing trail made of hard packed red soil cut through by rain water flow, randomly inter spread with generous amounts of sand. I had my heart in the mouth and was really nervous but wanted to hang in there as long as I can. I made it past a couple of fast sections and sharp turns. Then we hit a narrow single track by the side of a field where I missed the line. In that frantic rush and at that pace I hit the brakes too hard and flew over the bars and flew into the field on the left. Thankfully, I was out of the racing line and the second bunch flew past. I quickly got up ignoring the pain from the groin area and the left knee and got right behind the second bunch comprising of Opendro, Gana, Tusker and a few others. A little ahead Gana had a hard crash in a muddy patch. He apparently landed on his left elbow after having the bike slide from under him in the mud and water. Instead of riding through that murky patch, a few of us got off the bikes and walked along the steeply sloping bank on the side to get to the other side before riding on. It wasn’t even 4km into the first lap and we began to see lots of action already. From there we got into a nice single track by the side of the fields. Later, we had to cut across the fields bouncing on a patch of fifty meters or so of speed breakers formed of hard packed ploughed lines. This was a little bone-shaking and chain dropping section. Right after this I saw that my front tire was flat. I was a little over 5kms into the first lap. My immediate reaction was, ‘Ah..Come on.. Not again! !’ Then the optimist in me kicked in and said, ‘Awesome! The race is over for me. I don’t have to suffer anymore! :)’ So, I lifted my bike up began walking. Lots of riders went past me with sympathetic nods as they rode past. Balu offered a tube as he rode past me and I waved him off to go ahead with his race. Then Rahul Thomas came along and stopped and forced a spare tube upon me. I tried resisting saying he might need it when he said, ‘No worries, I have more’. ‘Jeez..! You won’t let me be!’, I thought and reluctantly set about changing the tube as he fled the scene having done his part. I’ve spent quite a bit of time trying in vain to find the source of the flat but could not find any thorn or any such in the tire. Just hoping that the spare tube won’t go flat as soon as I put it in, I went ahead and changed the tube. Almost 20 mins was wasted in the process before I started riding again. With the hopes for the race dashed like that I was not sure if I wanted to continue and complete the race. ‘What is the point in suffering?’, I thought. I wanted to just complete the loop and get to the starting point riding instead of walking to it. 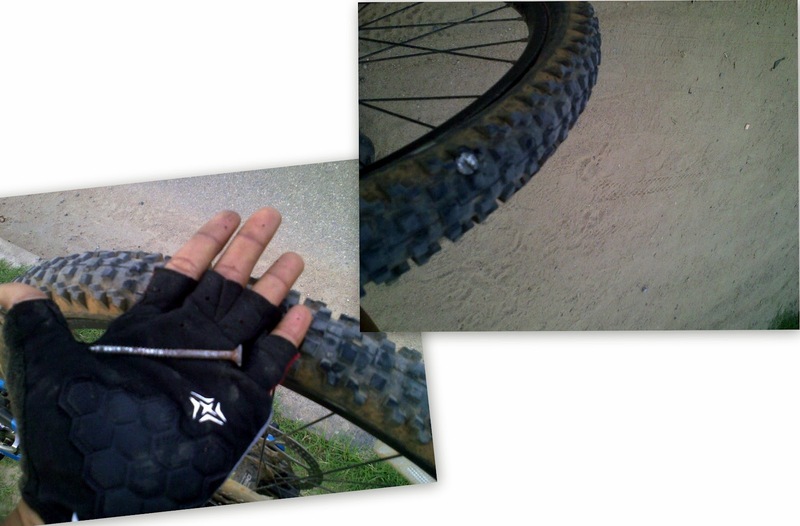 I2km into the first loop, I came across Surya who had a flat tire and was carrying everything but tire levers. So, I stopped to lent him my tire levers before starting to ride on. As I was reaching the end of the first loop, I felt bad about the prospect of giving up. Sure, I don’t have a spare tube if I were to flat again, but I could ride until the next flat or until I get lapped. That way, although I would probably be the last of the finishers, I could at least do some justice to the race, Rahul’s spare tube and Siva’s super awesome FuleX bike that I was riding. So, instead of stopping I sprinted past the finish line with a roar and started my second lap. A Bulldozer, A Tractor and A Snake..
Just as I was hitting the trail head for the second lap, Gana(Cleated Warriors) joined me. He was recovering from the bad crash and was riding with a sore elbow and quite a few scratches. Both of us set the pace for each other and kept riding steadily through the second lap. 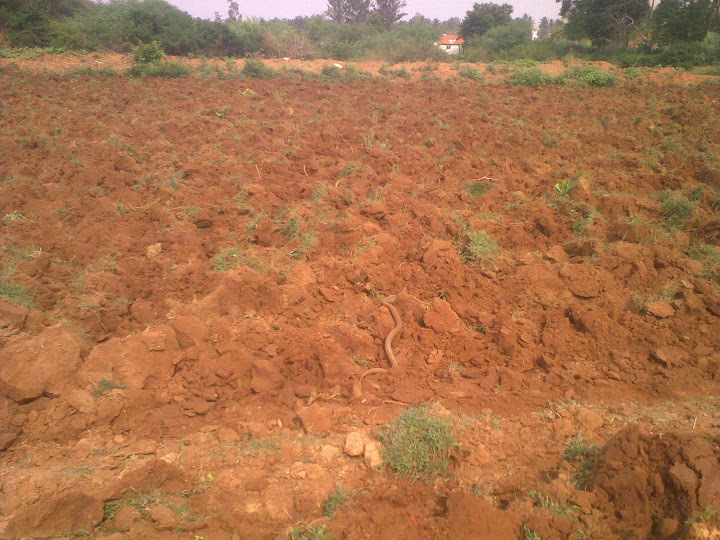 Just as we got into the field that was being freshly ploughed, we noticed that the tractor which was working on the edge of the field was heading straight at us. We stopped and let it go through and just as we started riding, we were shouted down by a farmer to alert us to a snake that was in our path. I quickly took out my cell phone and photographed the snake as it was going away into the field. Gana went ahead and crossed the field and I quickly woke up to the fact that it was still a race. I got on the bike and followed to join Gana. We rode together into the third lap and had to shout down another tractor and a bulldozer that were in the racing line to overtake them at different points. Towards the middle of third lap Gana and I were hoping to see the race leaders go past us so that we can call it a race at the end of our third lap. But with such a big loop(15km), the chances of getting lapped were slim. Towards the end of the third lap, Gana seemed to be tiring and/or hurting from his crash and I went ahead. I also went past Balu(Veloscope) who seemed to be struggling really badly. He apparently bonked very badly. May be because of the 20min break in between or pacing myself better having given up on the race, although I was suffering, I was not completely down as I began the 4th and final lap. As I began the final lap, I began counting down the kms. 15, 14, 13… As time went on, I began to see and pass people ahead of me. The roadie in me who was sulking till then for the mindless suffering began to feel a little glad that he would not see me finishing at the very last. In the middle of the lap, I saw Naveen(KYNKYNY) walking with his bike. He apparently crashed very badly and decided to call it a race. Then I saw and went past Bharath(KYNKYNY) who was racing on his MTB with his road cleats and probably paid the price with a fall or two. With 5kms to go I saw Rohan(Team BOTS) stopping by the side and stretching his back. My hurting back began to ask for a similar treatment but I shut it up and asked it to wait. As I went past, I saw Sri Ram(KYNKYNY) and began riding with him. I tried going past him but he was right at it and edged past me and began to build a gap. I didn’t give a chase but kept to my steady pace. With around 1km to go, I saw that he was slowing down and slowly went past. Just as I was entering the road stretch leading up to the finish line, I saw Jeff, some 300m ahead. The thought of giving a chase crossed my mind but bridging such a gap so close to the finish was not happening. I finished a few seconds behind him. He too apparently wasted a lot of time sorting out a mechanical with his saddle. It was 2 hr 50 mins of riding time and nearly 3 hrs 10 mins(approx) of total time(which would be my race time). Although in the end, I was happy that I didn’t give up, I got to HTFU in the races and be ready to suffer. I can not thank friends like Rahul enough who ensure that I’m on the right track and don’t give up. Meera(2nd), Shilpa(1st), Pooja(3rd) and Supraja(4th); Sri Ram giving away gift voucher from Pro-Bikers(?)/Scott! In Cat2, Deepak Mhasavade of Cleated Warriors took the podium at 1st place followed by Amarpreet Kalkat of Team Travelomy at 2nd, Kiran aka The Tusker of CW at 3rd and Santosh of Team Naesar Racing at 4th. Great show guys! The usual suspect, Darren in his black and yellow KYNKYNY Wheelsports kit took the podium at first place followed by Richard McDowell of Hyderbad’s OriginAbhiBus Racing took 2nd followed by KYNKYNY’s Kiran Kumar Raju at 3rd and Veloscope racing’s young gun, Siddharth Kansal at 4th for Cat 1. Great show guys! Take a bow guys! Superb job! The selection of the trail was super. It was suggested by Amarpreet Kalkat’s Team Travelomy and it was a great trail for the race. The guys did many recces, riding and re-riding the trail, refining it so that the road part is kept to a bare minimum and its safe to race on. Even then when the trail goes through fields, last minute surprises like ploughing happening on the race day are unavoidable and not in control of the organizing team. There were volunteering race marshals who were manning sections where the trail meets the road and were ensuring that the riders and the oncoming traffic don’t fall in love with each other. They also helped to give directions in tricky sections. Both the organizing team and the volunteers who turned up for the race did a stupendous job in making this race possible. For me it was the toughest so far! The bar for the suffer-fest has been raised yet again at BBCh! They also organized a kiddie race for the 10 or so kids that were patiently waiting there for more than three hours. Always enthusiastic, the kids had a blast. The guys from FRIOcafe sponsored Gatorade and a few much needed refreshments before and after the race. Many other sponsors like SCOTT Sports, CamelBak, The Sufferfest – Cycling Training Videos, Trek Bicycle, Gatorade Inc., Sigma supported the race by offering winner prizes while GVK EMRI provided ambulance and first aid support. Thank you all! Previous The Bulldog Goes Sub-30 on Nandi – Finally! !